Microsoft Lumia 940XL leaks - is this the new flagship Windows Phone? 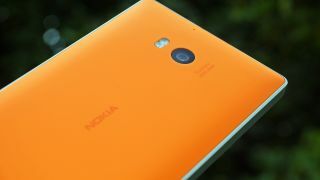 It's been almost a year since the last flagship Windows smartphone - the Nokia Lumia 930 - was launched, so the platform is certainly due a new addition. Say hello to the Microsoft Lumia 940XL. There have been a few rumours flying around about this handset, but we've now had the most comprehensive spec leak to date thanks to NokiaPowerUser. While the site notes it's unsure whether the 940 XL name will stick for launch, it seems a little more confident with the specs it has. The Lumia 940 XL is said to pack a 5.7-inch QHD display, octa-core Snapdragon 810 processor, 3GB of RAM, 32GB of storage, 20MP rear camera, 5MP front snapper, microSD slot and a slim, metallic unibody design. That would see it comfortably compete with the Samsung Galaxy S6, HTC One M9, LG G4 and Sony Xperia Z3+. The report also suggests the 940 XL will pack iris scanning tech (for what we assume will be added security) and a USB-C slot, allowing you to plug your charger in either way, much like Apple's Lightning connector. It's also expected to arrive with Windows 10 on board. The main reason we've not seen any top-flight handsets running Microsoft's software over the past few months is because manufacturers are waiting for the new version to arrive. There's no word on when the handset may launch, but with Microsoft confirming Windows 10 will land on July 29, a smartphone launch could well coincide.